In April the Connecting Waterways of the Detroit River attract countless anglers targeting spring run walleye. Motown is famous for pop music, automobiles, world class hockey and mouth watering ethnic foods. This sprawling southeastern Michigan city scape is a symbol of America’s industrial infrastructure. The Detroit landscape is made up of a complex mixture of high rise office buildings, five star motels, steel mills, ethnic restaurants, sports stadiums and auto factories. Smack in the middle of this very much urban lifestyle awaits a completely different and intimately more laid back lifestyle. Tons of travelers visit the Detroit Metro area every year, but one of the last things you would expect jet setters to pack in their luggage is a fishing rod. Not only does this metropolitan area offer everything a city slicker could hope for, the Great Lakes Connecting Waters that flow from north to south are also home to countless fish species and angling opportunities. The waters of the St. Clair River, Lake St. Clair and the Detroit River are collectively known as Great Lakes Connecting Waters. Together these waters form a shipping highway that links Lakes Huron and Erie. Not only are these waters busy with super tanker and barge traffic, added to the mix are countless recreational boaters, avid fishermen and an impressive fleet of charter fishing boats. The Great Lakes Connecting Waters in the metro area also form the international border between Ontario Canada and Michigan. anglers visiting Motown can expect to catch in large numbers. The species of fish found in these waters varies by the season. In the spring time the most abundant and sought after species include walleye, yellow perch, northern pike and steelhead. As spring eases into summer, the fishing focus changes to include a mix of warm water species such as smallmouth and largemouth bass, white bass and the mega sized muskie this region is famous for. Compared to more rural fishing destinations in other parts of the country, this metro area produces unmatched angling opportunities for walleye, smallmouth bass and muskie. In part this amazing fishery has developed because of some unexpected environmental changes. The culprit of these changes can be summed up in just two words -- zebra mussel. These tiny mollusks were accidentally introduced into the Great Lakes region and their numbers have skyrocketed in recent years. Zebra mussels filter the water, removing plankton and leaving the water exceptionally clear. Clear water allows light to penetrate and in return aquatic plant growth has expanded into areas that historically did not support plant growth. As aquatic plant growth encompasses more and more of the available habitat, sport fish like walleye, smallmouth bass and muskie have benefited from these changes. The species which are enjoying the most benefits are the smallmouth bass, largemouth bass and muskie, each of which thrive among weed cover. Just recently the Michigan state record for muskie was broken in Lake St. Clair and catch rates for this species have never been higher in all three bodies of water. Smallmouth and their cousin the largemouth bass are also experiencing population booms as a result of the expanding weed growth. The real benefactors of these unexpected changes are the masses of sport fishermen who flock to the area in search of sport fishing adventure. Motown region, but tasty walleye like this continue to be the big draw. The vast majority of anglers who fish in these waters are freelancers who hit the water with their own boat, motor and fishing equipment. Because these are border waters, it’s recommended that visiting anglers purchase both a Michigan and Ontario fishing license. 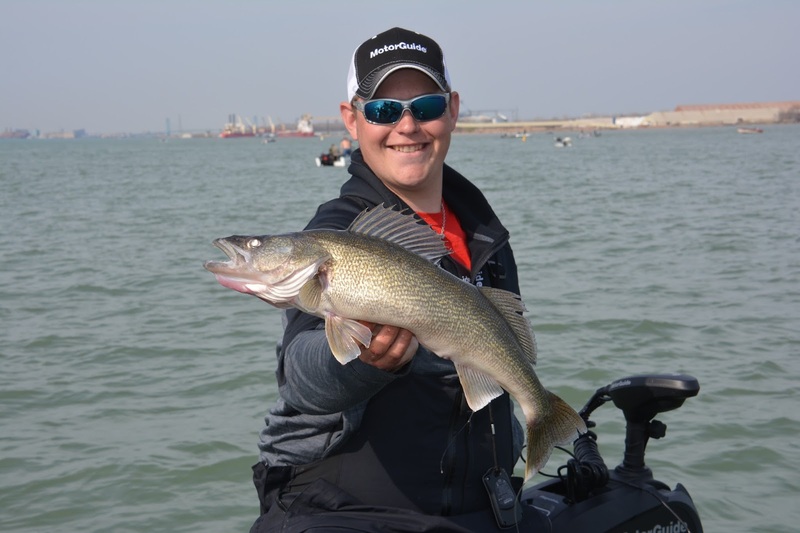 Both the American and Canadian sides harbor great fishing opportunities and the precise locations of these borders is not always easy to identify on the water. Crossing into Ontario waters requires anglers to call in to the Canadian Border Services Agency using a cell phone. For more details consult the following web page, http://www.cbsa.gc.ca. The species most often targeted by freelance anglers include walleye and smallmouth bass. In some cases these fish can be targeted from shore, but the premier fishing spots are typically best accessed by boat. Walleye are most often targeted with medium action spinning tackle, armed with 8-10 pound test braided fishing line and lead head jigs ranging in size from 3/8 to 3/4 ounce. Tipping the jig with a live shiner minnow is customary, but many anglers prefer to use soft plastic minnow imitations. Smallmouth bass are also targeted with spinning tackle. A suitable rod and reel combination for bass fishing includes a medium to medium heavy action rod from six to seven feet in length matched to a spinning reel capable of holding 150 yards of 10-15 pound test super braid line. For terminal tackle, bass anglers will find that a mixture of jigs tipped with soft plastic grubs or jigs and tube baits work wonders. 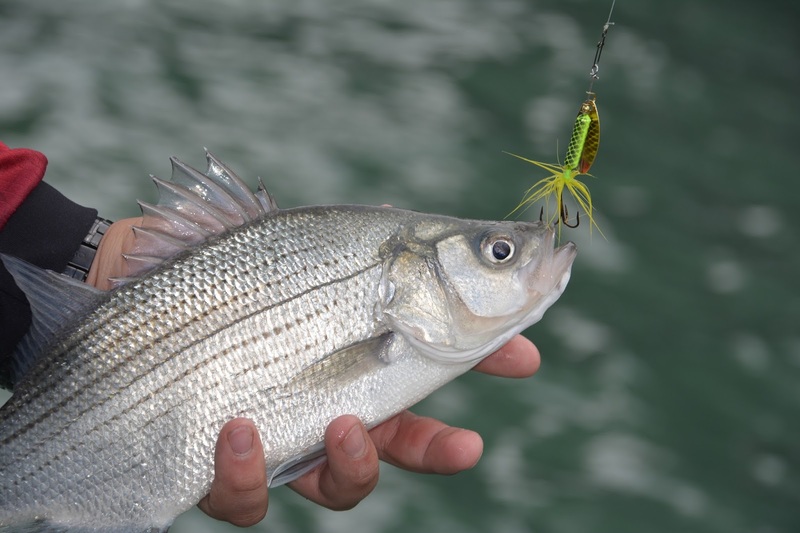 Spinnerbaits are also important bass lures when fishing in or around weed cover. Diving crankbaits are popular lures for targeting both smallmouth and largemouth bass in these waters. The water clarity in each of these fisheries is clear to slightly stained. In the case of both walleye and bass fishing, natural lure colors are strongly recommended. Fishing waters as good as these also attract scores of charter boats who cater to locals and the growing number of visiting anglers. Those anglers looking for a day or two of entertainment and fishing adventure will find an ample supply of charter fishing trips. Charter captains target all the popular species, but not every captain offers a mixed bag of fishing options. Charters tend to specialize in one species or type of fishing, so as to offer their customers the best possible chance of success. It’s important to note that some species just lend themselves better to charter fishing than freelance fishing efforts. The muskie so popular and abundant in this region is a prime example of a species that’s best targeted with the help of a local charter captain. The highly specialized fishing tactics and gear required to target muskie, strongly suggests incorporating the professional services of a charter captain. 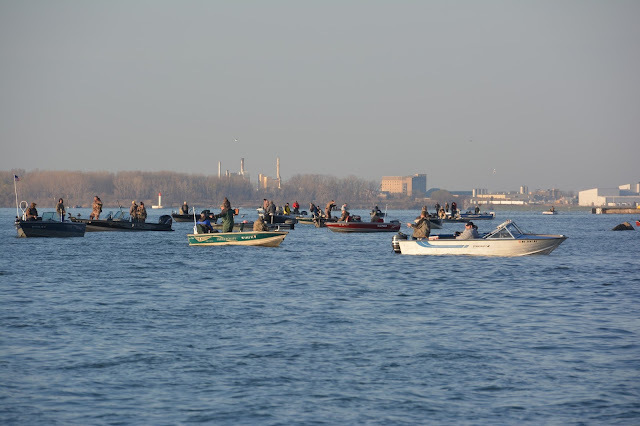 The industrial landscape of metropolitan Detroit certainly ranks as a unorthodox setting for a world class sport fishing destination. It takes the visiting angler a little time to come to terms with the urban culture shock new comers experience on these waters. Thankfully, the culture shock is quickly replaced with memories of red hot fishing action. Who would have guessed that one of Motown’s most enduring qualities can only be experienced with a fishing rod?